We love seeing past customers and their dogs. It gives us opportunity to get a bigger picture of the dogs we produce and sell. We gain valuable information in regards to how those dogs have performed for you and incorporate that feedback into future breeding plans. Give us a call or shoot us an email with your comments and don't forget to include pictures of you, your dogs, and your hunting trips. 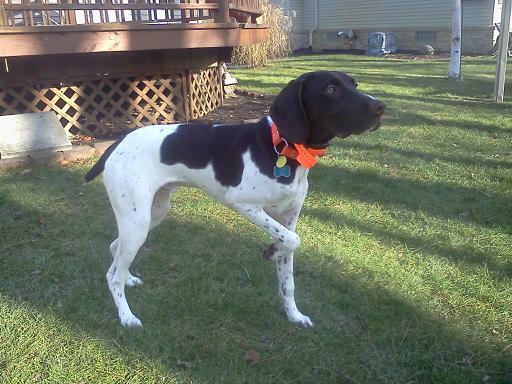 Here's a few pictures and emails from happy Grand River Gun Dog customers. Hey guys! Things are going well with Remy. He's a ball of energy 100% of the time unless he is sleeping and requires a ton of exercise. We love it because he loves hiking more than anything! He's seen quail on three separate occasions, most recently on Sunday. I took him to a bird dog club about an hour away, and released two quail. Came back 30 minutes later and he found both within 15 minutes. He points for a good 15-20 seconds, doesn't break until the bird flushes. It is amazing how the one thing he loves more than anything is birds. You can see it in his behavior, once he gets within 100ft of one, he just radiates energy. He's also learning commands amazingly fast, and has ~90% recall to the come command (unless birds are involved, then all bets are out the window :-) and just recently started responding to whoa. He's already almost met my expectations for what he should accomplish in his first hunting season, and he's only been with us 3 weeks! "We are doing well and so is our pup, Moose. I would love to bring Moose out to see you, and maybe get some training tips....as you can see in the pic's, I think he takes after his dad." "I was very impressed with (Floyd), how well he was pointing the birds at such a young age, his alertiveness, and intelligence. He was also very energetic and quite friendly. These are all things that I was looking for in a pup. 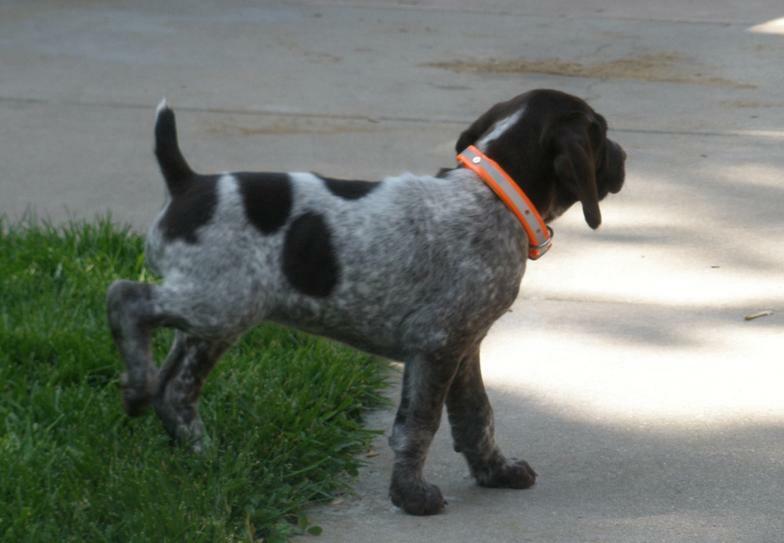 And while I have had a few sporting dogs, this will be my first time training a dog to hunt, and having one with that natural ability and also knowing that he wants to be with you and not wandering off doing his own thing is certainly worth the extra $." Kevin's & Stephanie's pup MOOSE. Quite a pup for 13 weeks old. 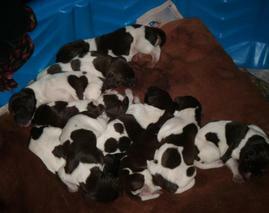 ​This is our second time breeding our GSP Jackie with Buddy, the first litter was 8 pups this litter 10 pups were born 6/10/11. All of the pups show natural hunting instincts with noses to the ground and stalking as early as 4 weeks old. Very happy with the outcome of the breeding. All pups are healthy, bright eyed and curious. Nice job to Buddy & Jackie. ​Steve did an excellent job of handling the stud process. His stud, Buddy, sired a beautiful litter of 10 puppies with our dam Bella. Steve is very helpful in all of the steps of breeding. I highly recommend his service. The experience was worht the drive from Algonac, Michigan. 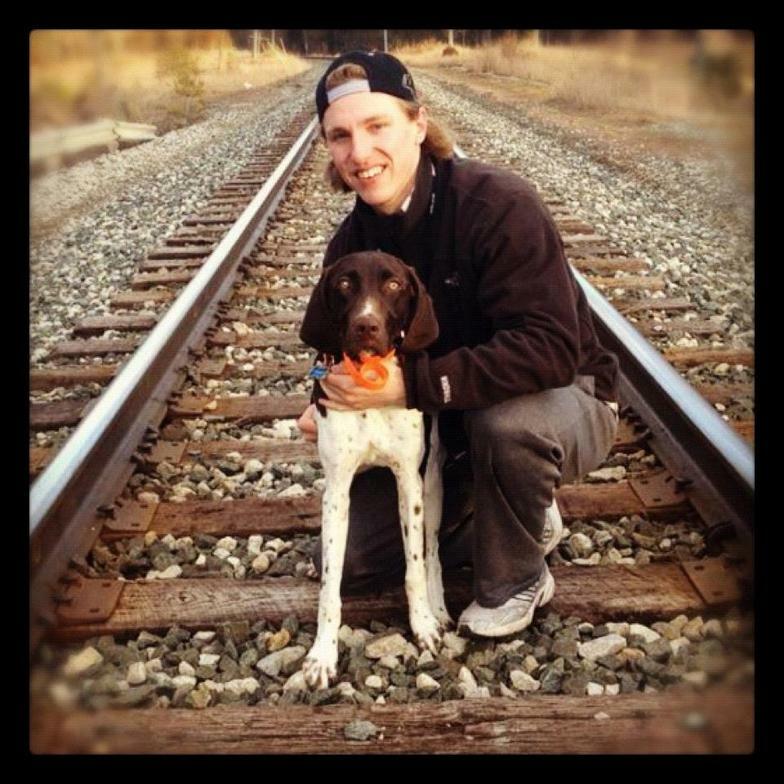 "Probert" shown on point on the left, and ont the tracks with owner Drew Meyers. 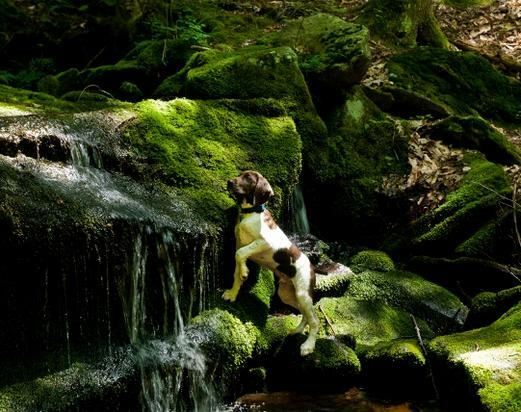 "Probert is doing great and becoming an awesome gun dog." Thanks for the email. Jenny and I were extremely pleased meeting you, your wife, and your son. It is a sigh of relief that there is someone out there that I can say I truly respect as a breeder and love for hunting dogs. You remind me of my father, with even a higher compassion for your dogs and it was great to witness this. Morgen is doing really well. I have been taking her out on "off road excursions" three times a day. So far she has been exposed to water and the various habitats we will be hunting in. I have been getting her to develop her prey drive with any bird we come across. This will cease in another week or so as she will be exposed to quail from then until September, grouse, and Pheasants there after. The dog is a natural retriever and something I have focused exclusively since I got her. Today was her first retrieve/gun simulation. Since I live in city limits, I cannot shoot a gun and opted for two leftover blocks of 2x4. The clap of the wood never phased her as she ran excitedly after the falling bird bumper, and brought it back to me. She is extremely intelligent and I have not had one accident in her crate!!!!! This is huge and it is the first time I have ever seen such a thing from a young dog. Her pointing instinct is very strong. I will keep you posted on her improvements and send action photos when I can. ​Not all new owners in pictures: Bret Wheatlake - Kevin Sopoliga - Tyler Backman - Mike Dodd - Dave Schlattman - Heath Kunse - Duane Fox - Shelly & Dave Walker. Just a quick FYI, We got a very nice note from a new pup owner, they were so happy with their pup. It's a great feeling! Left: Evan Phillips 8 month old Duke out of Scharrer's Pistol Pete and Scharrer's Gale Storm. Right: Scharrer's Red Velvet backing young Duke. Left & Right: 1 & 1/2 year old Nitro. Nitro Sired by Scharrer's Buddy out of Gamble's Tazmainian Devil. LEFT: Gene Fletcher with his 11 month old male pup Trigger. Trigger is sired by Silverdollar's Sachamo out of Scharrer's LC. On right: Oscar Moreno's 10 week old pup sired by Scharrer's Pistol Pete out of Gamble's Tasmainian Devil. "Steve, I apologize for being so far behind in updating you on our pup, Chaunty, from your Pete/Taz litter. 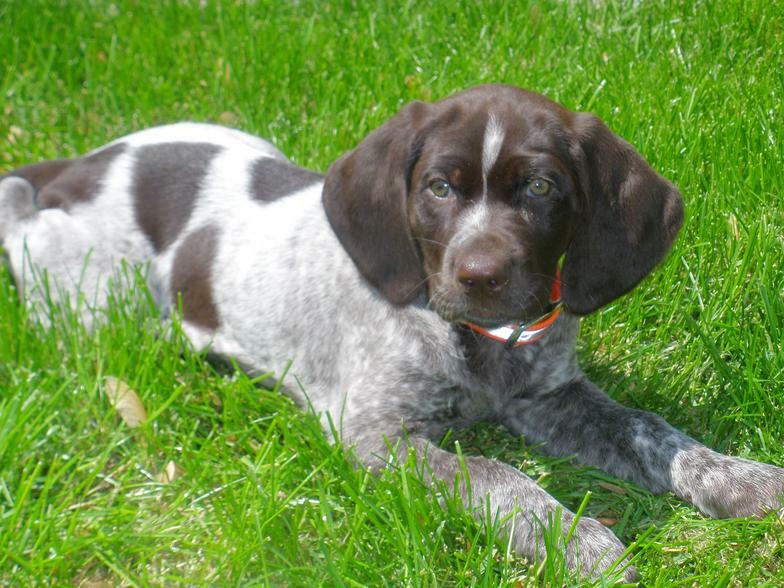 He is growing beautifully, and our vet that raises and hunts English Pointers just loves him. He is smart, loving, and already shows his hunting instincts. I will forward photos soon, but I just wanted to tell you how much me enjoy him and are happy with him. He gets tons of attention anytime we take him out. Thank you again for taking so much time in answering our questions. Thank you, Oscar and Amy Moreno"
"Thought I'd send you a couple new pictures of Murphy. He's getting big. Loves to go camping with us, absolutely loves to swim and spends his afternoons hiding bones in the back yard! He has quite the personality." On left: Rebecca Krupa's 6 month old male pup sired by Scharrer's Buddy out of Scharrer's Gale Storm. 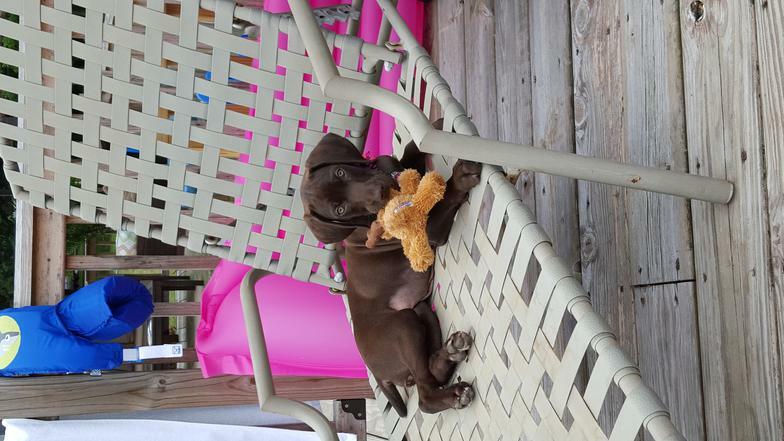 "Here is another one she is about 9 weeks old here. She owns every chair in our household-or so she thinks! We love her! She is from the Taz and Pistol Pete litter." 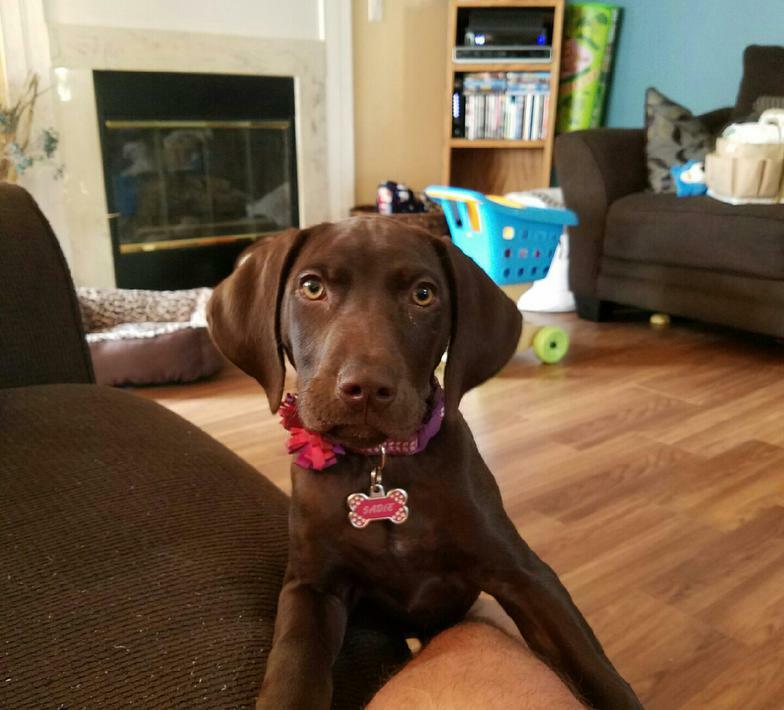 "Double click here to add text.Here is our Sadie girl. She is just shy of 3 months old here. She is a spit fire!! Full of energy and into everything! So much fun!" Left & Right: Amanda Kuberski's 8 week old pup Sadie. Sired by Scharrer's Pistol Pete out of Gamble's Tasmainian Devil.